A playground that is short on space can still offer big fun for children. The Bungalow is the ideal commercial playground solution for daycares, schools, churches, or outdoor parks. 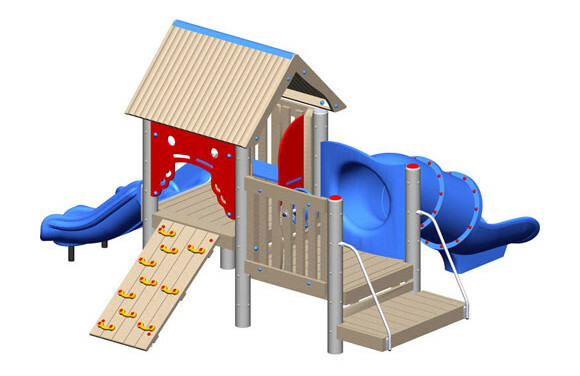 This play structure is designed for children aged 2-5 years and features a number of fun activities to engage up to 22 children at the same time. The Boone is a whole lot of fun and great value in a 29 x 27 space. The Bungalow is manufactured with 78% recycled materials. In fact, 7,584 plastic milk jugs and 225 lbs. of reclaimed scrap metal is used to manufacture the commercial playground structure, making it a playground product you can feel good about purchasing. At American Parks Company we are proud to offer products that promote sustainability and ecological responsibility. The plastic elements are fabricated with a rotational molding method, which is a durable process for producing components without a seam. 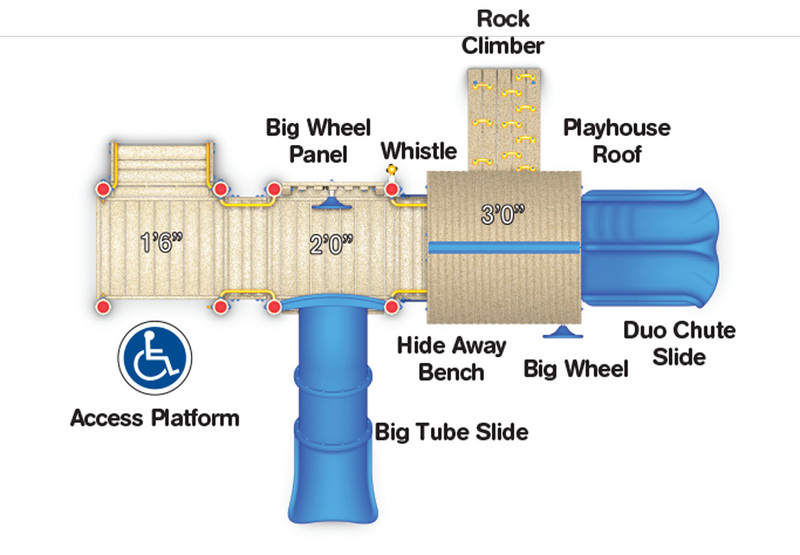 When it comes to playground equipment this process increases the durability of the component, and creates rounded, comfortable design options for slides, seats, stairs and tunnels. 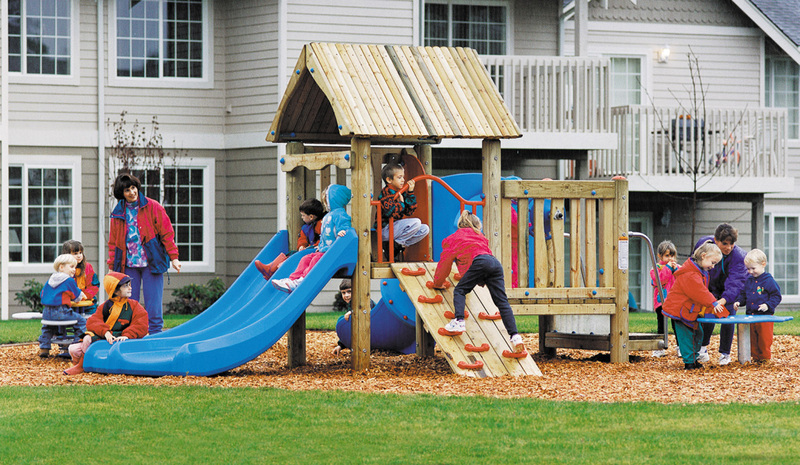 American Parks Company offers quality commercial playground equipment with a 15-year limited warranty. Kids love the adventure of the Big Tube slide. Give them a place to clamor with a fun Rock Climb. Let them race their friends to the bottom with our DuoChute Slide. Play hide-and-seek or get out of the sun and take a seat on the Hideaway bench. Durable roto-molded plastic in 18 custom color options. Metal components available in 12 colors. UV stabilized plastic components resist fading. ASTM and CPSC certified equipment. 15-year limited warranty on rotationally molded plastic components. Posts are 3.5 in diameter and 12 gauge galvanized steel. Powder coated for a high gloss finish, the posts are backed by our industry leading 50-year limited warranty. 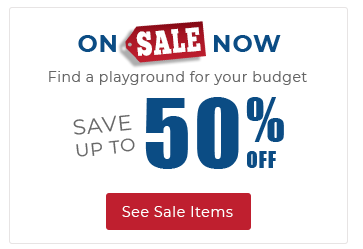 American Parks Company is an industry leader in quality commercial playground equipment. Call a representative at 1-800-381-4491 to learn more about our products and nationwide installation.